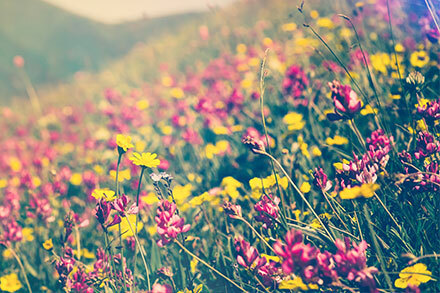 There are fewer things more beautiful than looking across a meadow of wildflowers but did you know you can create a mini meadow in your very own garden? This guide will show you how…. There is much more to wildflowers than natural beauty. As well as adding spectacular colour to your garden they do a very important job. Wildflowers create a diverse environment that will attract and help support birds and insects including bees which are vital to our ecosystem. Where to Sow Wildflower Seeds? Wildflowers have a reputation for being difficult to grow. The reality is that they grow really well, as long as you have the right environment for them to grow. Areas of your garden that are naturally low in nutrients are ideal. Yes, that means they like poor soil! If the soil is too rich you will end up with mostly leaves and perhaps a few flowers if you’re lucky. Avoid using fertilisers and weed killers near the area you wish to sow wildflowers. Make sure all clippings are removed from the area you wish to sow on as these will also pass nutrients back into the ground. The nutrient levels will eventually come down creating the ideal environment in which to grow wildflowers. If the chosen area for your wildflower meadow is heavily cultivated then it may need to be starved of nutrients for up to two years before it’s ready for wildflower seeds. Once you have the right soil conditions it time to prepare the ground. This is a key step and will give the wildflower seeds the best chance of germinating. First things first, make sure the area you plan to sow on is free of weeds. This will involve a bit of manual work but in the long term you’ll be glad you did it. Weeds in the ground will compete for light, space and food, so help wildflowers to thrive by removing them. Once all weeds have been removed, dig over the soil, firm it down then rake it. Once the soil has been prepared as detailed above you are ready to sow. Regarding our own Wildflower Seed mixtures we recommend a sow rate of 5g/m2. Most of our wildflower seeds can be sown in either spring or autumn but it’s always important to check the usage guides as following these will help you get the best results. 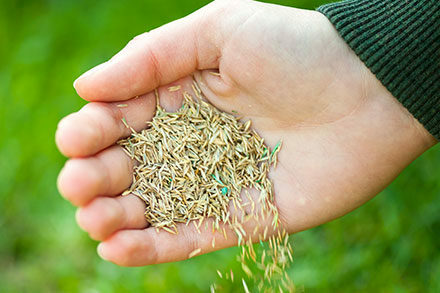 Scatter your wildflower seeds by hand or you can use a seed spreader. Once down, rake into the soil lightly and give them a good soak. If you’re concerned about birds or cats you can cover the area with netting to protect the seeds while they germinate. It’s important that the soil is warm and doesn’t dry out. If there’s a very hot spell of weather you’ll need to water the seeds regularly. One of the great things about a wildflower meadow is its low maintenance (not no maintenance). After the seeds germinate and start to grow you might see weeds coming up with wildflowers, we would recommend keeping your wildflower meadow weed free for the first year. At the end of summer it’s time to mow your wildflower meadow. The tell-tale sign for when to do this will be when your flowers have ripened and dropped their seeds. Set your mower to a high setting and carefully run it over the top of the meadow. Doing this will make sure your wildflower meadow is ready for the following year. The final step is to rake up any clippings, again to prevent the nutrients being returned to the soil.